No, I'm not at BlissDom, and yes, I'm a little sad to be missing out on all the fun. Mostly I'm sad to be missing out on the fellowship. Getting to meet fellow bloggers must be great! I hope to go next year. 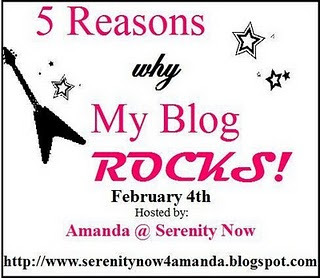 For now, I'm joining a party hosted by one of my blogging friends, Amanda at Serenity Now. Amanda had the wonderful idea of hosting an online party for those of us who would love to be at BlissDom but weren't able to make it this year. Isn't she smart? Amanda is asking her party guests to come up with a list of five reasons why their blogs rock. As she put it, how would we "sell" our blogs to a potential sponsor? What makes us special? This kind of assignment is hard for me, but here goes. 1. Imparting Grace is a place of honesty. I love to share my ideas and thoughts about things, and sometimes I have some good ones. But I've messed up an awful lot in my time, too, and I'll tell you the truth. I take delight in sharing my faith here, and the Lord of my life is very much interested in truth-telling. It's not always pretty, but it is real. and coming up with some of my own. 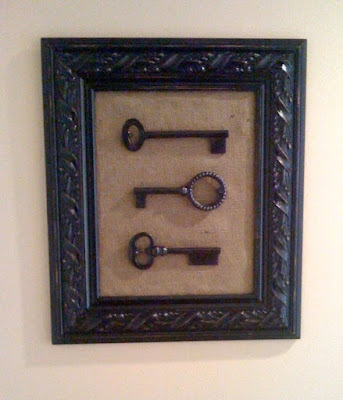 In short, I like working to make my home beautiful, and I like to share my ideas with you. 3. Imparting Grace is a place of friendship. Honestly, I think the greatest blessing of blogging is the friendships that can be developed here. I love being part of this blogging community, and I'd love to get to know you! 5. Imparting Grace is a place of encouragement. I guess that, if I were going to try to pinpoint one thing that sets me apart as a blogger, it's that I've lived through a LOT of life experiences. I've enjoyed many blessings and struggled through many challenges, some of them life-altering. I know how it feels to be in need of encouragement, because I've been there so many times myself. And so I try to make this blog a place where you can find a little bit of inspiration, a little bit of humor, a little bit of fun--and a whole lot of grace. So there you go! I hope that's enough to make you want to take a look around--I love welcoming new friends. Amanda, thank you for getting us together! Stopping by from Amanda's party . . . great site! Keep blogging and rockin'! I'm stopping by from Amanda's party. I always enjoy reading your blog and think that you have great posts. "It's not always pretty, but it is real." I love that! Stopping by from Amanda's party! Thanks for stopping by! Love your ideas! No doubt about it your blog rocks in my world. I feel right at home here! Well said!! Love that holiday photo. Hi Richella! I really appreciate your honesty- your lovely soul seems to shine through in every word you write! And your porch looks like a little slice of heaven! That picture of your home over the holidays looks like a picture straight out of Southern Living (my FAV magazine!). I'm off to check out the rest of your blog for more pics to ooh and ahhh over! Thanks for the blog love today! It's great having a super-tall hubby, huh?? Your blog definitely rocks in my book! I love your blog Richella and I've been following it for a while. I'm at Blissdom with my sister Traci but I don't have a ticket. She says I'm her "personal assistant" HaHa. Have a great weekend. I wish you were here I'd love to meet ya. Oh Richella! All five things are Oh So True! And may I especially thank you for being grammatically correct? My little pet peeve in blogland is terrible spelling and grammar. If I see one more "loose" instead of "lose" (as in "I hate it when I loose my car keys") I am going to scream!